Well that didn’t take long! 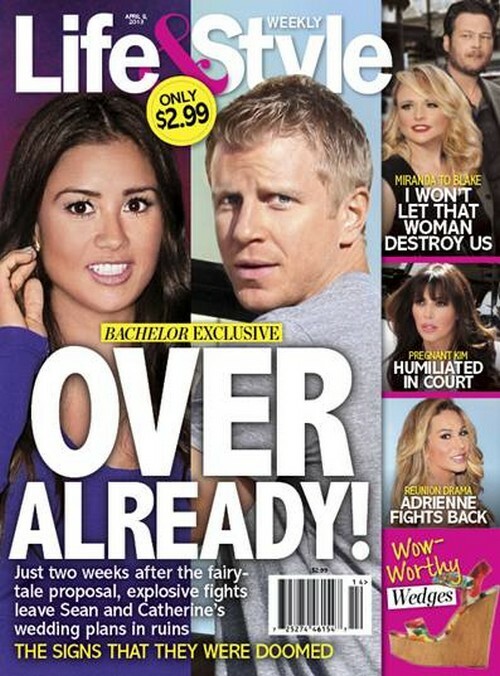 The current issue of Life & Style Magazine features the cover story, “Bachelor Exclusive – It’s Over Already!” The magazine claims that just one week after the Bachelor finale, where Sean Lowe professed his love for Catherine Giudici, there is already trouble in paradise and the relationship is doomed. Life & Style reports that the two are fighting like cats and dogs and they have the scoop on what went down when they hit The Sayers Club in LA. To add to this people are reporting that there is a clear “chill” between the two. Could the reason behind all this fighting be Catherine’s insane jealousy? Catherine is reportedly not pleased that Sean is dancing with Peta Murgatroyd on this seasons DWTS. For more info on Catherine and Sean’s relationship and their explosive fights, pick up the current issue of Life & Style magazine.